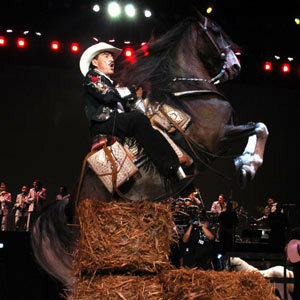 Joan Sebastian (born in Juliantla, Guerrero, in 1951) is a popular Mexican singer and songwriter. He has composed hundreds of songs and been a regular staple on the top-40 charts in Mexico since his career began in 1977. His music is a mixture of Latin pop, ranchera and grupera music. His success is not only found in music but also in his short acting career when he became the main protagonist of a Mexican soap opera. In 1996 he made his acting debut in the Mexican soap opera T? y Yo (You and I) sharing credits with Maribel Guardia (his former wife and mother to one of his sons) the soap opera became an instant televised hit. Before he had a big successful music career Jose Manuel Figueroa (Joan Sebastian's legal name) passed most of his childhood from place to place. At age eight he was sent away by his parents to Guanajuato for school. When he was eleven he return to Juliantla, his native town, this return inspired him to begin formally composing. But he was sent off again to a monastery in Morelos where he was under the care of father David Salgado. Due to the influence Father Salgado had on Sebastian he took the decision of becoming a priest. So at age 14 he enrolled in the Seminario Conciliar de San Jose(located in Cuernavaca, Morelos). But he soon realized that music was his true calling so when he was 17 years old he abandoned the seminary to dedicate himself completely to the music business. Meanwhile he made a living as an administrative assistant in a vacationing resort in Oaxtepec, Morelos, where he would sing through the intercom. It was in that resort that Sebastian found the incentive he needed to pursue his singing dream more aggressively. The year was 1968 when Joan Sebastian encountered Ang?lica Mar?a (a famous Mexican actress) who was looking for a place to stay. While she waited she asked him if he sang and the following day he sang for her six songs. Ang?lica Mar?a suggested to Sebastian that he record the songs and gave him the telephone number of Eduardo Magallanes, a music producer. Without hesitating Sebastian moved to Mexico City and began knocking on doors until Chucho Rincon from Discos Capitals agreed to listen to him and thus began Sebastian's artistic career. He recorded his first disc and the positive results came fast when in Ciudad Obreg?n, Sonora, the song "Descartada" sold 12 thousand copies. previous. His most recent production up to date is "Secreto de Amor" which was released in 2000 and sold over 1 million copies.